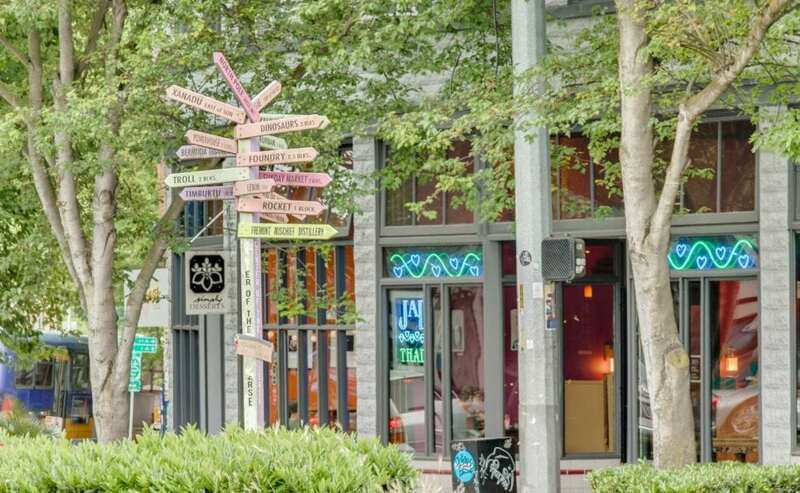 Fremont prides itself on being a little quirky and homespun. It's self-proclaimed status as "Center of the Universe" is referenced in several public artworks (including floating planets and a rocket atop one of its many independent boutiques), but that's just the start of the oddities. From the statue of Lenin (which is actually privately owned) to the Troll under Aurora Bridge to a wire sculpture of dinosaurs covered in English Ivy, Fremont never lets you forget that there's no place quite like it. Among dozens of independent shops (and a large consignment and antique market), you'll also find great bars and cafes and some of the city's most popular restaurants. Getting in and out from downtown can be tricky at certain hours, though. Fremont's drawbridge is the most frequently raised drawbridge in America, so traffic crossing the canal is often backed-up (especially in summer). Planning for delays is important, especially if you are taking one of the many buses, such as the 40 (passing through Fremont to Ballard from South Lake Union and downtown) or the 62 (connecting Sand Point to Pioneer Square, via Fremont and Queen Anne). Fremont has its own office complexes, with Google being one of the larger occupants, making it a neighborhood that truly combines Work and Play...and it really doesn't skimp on the latter. Theo Chocolates: The HQ of Theo Chocolates makes Fremont smell heavenly. Sample and buy their sweets and feel heavenly, too. Brouwer's Cafe: Chill with a beer (from a selection of hundreds) and Belgian style food in this converted warehouse. Fremont Canal Park: Trails along the Fremont Canal offer gorgeous and unique views of the bridges, Queen Anne and Lake Union. RockCreek: Fresh, seasonal and globally sourced seafood impeccably served in an airy, two-story lodge-style setting. Quoin: Come for the unique cocktails. Come early for the happy hour ramen special, made in limited quantities.